An inspirational programme to help local young people fulfil their potential was launched for a third year running with 100 school students from six Crawley schools on Friday, November 9 2018 at the Charis Centre, Crawley. 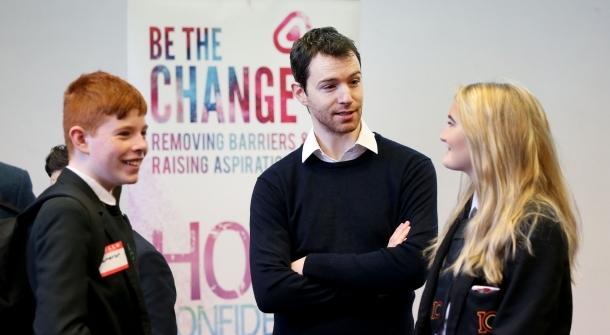 Be the Change has been developed by LoveLocalJobs.com and Be the Change co-founder Graham Moore of metamoorephosis to help 13 and 14 year-olds negotiate the gap between education and employment. Business volunteers from the local business community play a pivotal role throughout the programme, providing support and guidance for the young people. The impressive list of businesses supporting include First Central, B&CE, Crawley Borough Council, L3 Commercial Aviation, NatWest, Search Consultancy, SHW and Sussex Community NHS Foundation Trust. At the ground breaking launch, the students and business volunteers took part in activities that focus on happiness, confidence, hope, relationships and employability. The schools involved in the programme are: Ifield Community College, Hazelwick School, Holy Trinity Church of England Secondary School, St Wilfrid's Catholic School, Oriel High School and Thomas Bennett Community College.